How many of us have come across a purple emperor? Those who have can certainly testify that the sight is quite breathtaking. 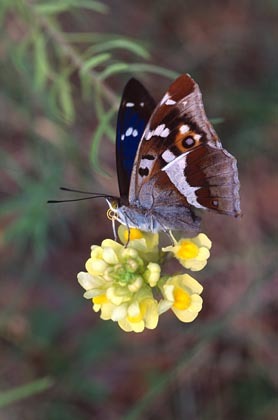 A white pattern covers the blackish-brown wings, the edges of the wings have a delicate orange and blue tracery; the wing span is up to eight centimetres. Only the wings of the male have the blue-purple shimmer or iridescence, and that only in the proper light and at a certain angle, otherwise the wing pattern of male and female are similar. Powerful fliers who quite often glide on their large wings during flight. It is worthwhile to look out for them where oaks grow and in light deciduous forests, parks and cemeteries are also possible habitats. Why we so rarely see them : they fly at tree top height, feeding on fermenting tree sap and they have little business on the ground. When they are on the ground we can see the undersides of the wings with their grey-brown pattern, and with an eye mark edged in orange on the forewing. They belong to the Nymphalidae family.